DENVER — Skyline Park is known for gathering the largest crowd of people to participate in a costume event dressing up as their favorite undead character. The Zombie Crawl also offers a variety of events to participate in along with the annul March down 16th St. Mall towards Glenarm and then back to Skyline. There’s costume contest, food, live music by the Window’s Bane, how to defend yourself from zombie demonstrations, face-painting, food and tons more. “Last year, I painted at least 200 people’s faces as zombies, and the majority of those people have all told me that they are coming back this year because they liked the feel of dressing up and looking like real zombies,” said Chris Reid make-up artist for the event. The options are limitless at the Zombie Crawl. You can go as a regular person who gets chased by the zombies, or a character that tries and captures and kills the zombies, or a zombie. Last year there were 7,600 people that participated in the Zombie Crawl. Organizers are anticipating an even higher number this year that they are having a Zombie Counting Machine that everyone must go through before they head out on the march. The city of Denver is closing all the main streets leading up to the 16th St. Mall, and have set rules in place to keep everyone safe since it is going to be the largest number in the six years that the event has being going on. 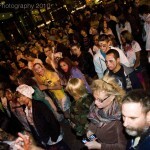 Daniel Newman the event organizer has estimated that there is going to be 20,000 zombies this year, the world’s record. 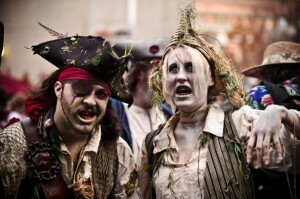 The Zombie Crawl is becoming not only individual’s traditions but the City of Denver’s as well. 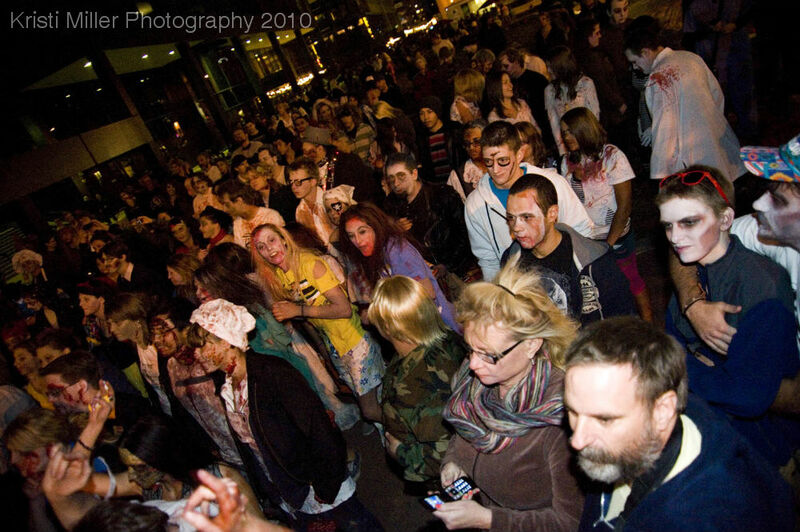 The whole downtown Denver area including the shops along the strip all prepare and give into the Zombie Theme. Shoppers along the strip even stop to; look, laugh, and get scared from the zombies. “I went last year and it was nothing like I pictured, it was even better. Now, I want to really out do everyone and buy the best costume and wear the goriest make-up yet,” said Carlos Esparza. The Zombie Crawl has many volunteers to help anyone wanting to scare others with their make-up, and now that the event has become a phenomenon, they have professional artist to give the real effects of brains falling out of your head, and other parts of your body falling out. Costumes can be anything from an everyday outfit with blood spatters on it, to a Disney Princess or Pirate with a painted zombie face. “I have been counting down the days since October and practiced several different ways to which I plan on wearing my make-up for the event,” Esparza said. Denverites or those traveling through during the time of the Zombie Crawl are advised to check out the event. That is, “those who aren’t afraid of the walking dead, or getting attacked by zombies. Those that, are ready to get scared and be scared. Those that want to enjoy themselves and participate in a Halloween fun filled Tradition,” Reid said. One thing that would help is calling it the Zombie Crawl in the lead, because you refer to it as the crawl before you introduce it. I can’t believe this has been going on for six years. I’ve lived here for the past 8 years and have never know of this event. I will try to get down there to see it one of these years. Good story. Photos are increadible. The lighting on the last picture, nothing short of rocks! I think there’s an error in the fourth paragraph, did you mean “annual,” instead of “annul?” Other than that it is a smooth and fabulous read. “Denverites?” dig it.